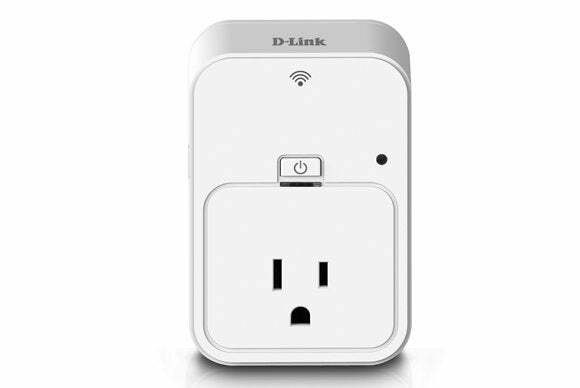 Plug D-Link’s DSP-W215 Wi-Fi Smart Plug into an AC outlet and you can use your smartphone or tablet to monitor and control any device that you plug into it—locally or from wherever you have Internet access. You can also integrate the Smart Plug into D-Link’s broader Connected Home Platform. But since it’s designed to control anything from a lamp to an oscillating fan, control is limited to turning the device on or off. It can’t do other useful things, such as dimming a connected lamp. D-Link offers apps for the Android and iOS operating systems. You must open a mydlink account and enroll the Smart Plug if you want it to work with D-Link’s other connected-home devices. You’ll need to provide your email address (and your smartphone number if you want to receive SMS messages), but the service is otherwise free—apart from enduring ads for other D-Link products, that is. D-Link doesn’t offer PC or Mac software for monitoring or programming the device, and you can’t do those things from this web portal, either. The Wi-Fi Smart Plug is an integral component in D-Link's Connected Home Platform. Although the Wi-Fi Smart Plug is a wall wart, it doesn’t consume more than one AC outlet. Whether you’ll be able to fit a second wall wart into the outlet depends on the size and orientation of that second wall wart. The device has one button for manual control of the outlet, and a WPS (Wi-Fi Protected Setup) button for automatically connecting to your Wi-Fi router (it operates only on the 2.4GHz frequency band). I tested it with D-Link’s latest 802.11ac router, the DIR-880L, but it should work with any router. I have a bad habit of not reading instruction manuals before installing a product, especially when the product is in a category that I’m intimately familiar with. But when I opened the box with the Smart Plug, the only documentation I found inside was a GPL Code Statement (such a disclosure is required when a manufacturer uses software code subject to a GNU public license). So when I saw that the Smart Plug had a WPS button, the first thing I did was to connect it to my router using WPS. I saw this message often with D-Link's Android app; the iOS version seems to be more stable. “Okay, now what?” I said to myself. Then I remembered that D-Link’s PR department had sent me a printed reviewer’s guide for the product. Reading that, I learned that there should have been a quick installation card with the Smart Plug’s SSID and PIN printed on it. The first step is to install the Smart Plug using its Android or iOS client software. So I reset the Smart Plug, downloaded the Android app to my HTC One smartphone, and started over. It took a couple of tries before I could get the Smart Plug to pair to the app, but it finally worked. The first thing the app wanted to do was update the Smart Plug’s firmware. That took a minute or two, but then an error message popped up to report that Smart Plug app had stopped. The app asked if I’d like to report the failure, so I sent a message explaining what happened. Fortunately, when I restarted the app, it was able to find the Smart Plug and most everything operated as it should, except that every time I tapped the icon for the D-Link DCS-933L IP camera that was part of the system, the app would crash. When I installed mydlink Home on an iPod and tapped the camera button, the app reported that I needed to also install the mydlink Lite app. Once I did that, the iOS version of mydlink Home worked with the camera without a problem. I then went back and installed mydlink Lite on my Android phone, but it didn’t help; the app continued to crash when I tried to access the camera. You can’t be in a hurry when it comes to controlling your lamp. It takes about 15 seconds to launch the app and then for the app to connect to the Smart Plug. If you’re in the same room as the lamp, it would be quicker to get up and hit the switch yourself. When you turn the lamp on, the app will report its current electrical consumption (in watts) and the temperature of its receptacle (in degrees Fahrenheit or Celsius, depending on how you’ve configured it). You can set a high temperature limit and the Smart Plug will automatically shut off if that temp is exceeded. the Wi-Fi Smart Plug is relatively small and shouldn't block an adjacent outlet. Tap the arrow on the right of the screen, and you can bring up additional information and controls. Tap the power-consumption button, and the app will report the power consumption (for the Smart Plug and whatever is plugged into it) on a calendar or on a defined date. Tap the wrench icon on this screen, and you can establish a power limit (the Smart Plug will shut down when it reaches the consumption budget you’ve defined). The budget is based on kilowatt hours (the default value is 30 kWh/month, but you can change this as well as the beginning of your utility’s billing period). The app will issue a warning when you near that limit (default value is 80 percent, but you can change it to whatever you like). This is a good idea in principle, but you’d need to have Smart Plugs controlling a majority of your home’s lighting and appliances for it to really make a difference. And in my home, most of my lights are in the ceiling and controlled by wall switches. You can also program schedules when the Smart Plug will turn on and off. The Home and Away settings will be enough for most people, but D-Link provides three custom schedules as well. You choose which one you want to be active. The app has time-zone settings, but no controls for turning the Smart Plug on at dusk or off at dawn, and you can’t set “about” rules that would slightly vary the times the Smart Plug turns a lamp on or off in order to make it look as though someone is actually at home. If you’re using the Smart Plug for home-security purposes—to fool a would-be burglar who's casing your home into thinking someone is inside it—lights going on and off on a rigid schedule is a dead giveaway to any smart criminal. People aren’t robots. And as you’ve probably guessed, there’s no support for advanced features such a geofencing, where lights automatically turn on and off based on the physical location of your smartphone. Getting the most out of the D-Link’s Wi-Fi Smart Plug means confining yourself to D-Link’s walled garden of devices and apps and controlling it with your smartphone or tablet. Be sure to read my review of D-Link’s DCH-S150 motion detector to see how that device can trigger the Smart Plug, too. I do think D-Link is making a mistake in not following Belkin’s lead and embracing the IFTTT (If This Then That) service. It would remedy some of the Wi-Fi Smart Plug’s limitations while requiring very little effort on D-Link’s part. As it stands, D-Link’s device has little to recommend it. This is one of the least-intelligent smart plugs I've encountered. As cheap as it is, it's too expensive for what it delivers.